My only guess as to why this quilt block is named Cowboys is because of the movement implied. I can visualize a cowboy riding along, with his lasso winding around his head, prior to letting go to grab his quarry. Perhaps that is the job of the pinwheel shapes in the block. Again, this is only my interpretation. This four patch block will require a little more precision than some other, more forgiving blocks, as it is constructed entirely of triangles. 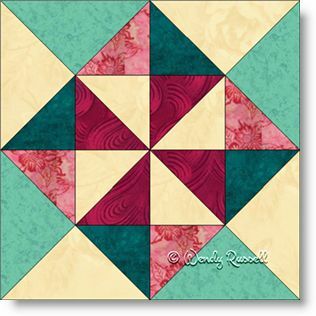 However, nothing is difficult to construct, so you should have great fun sewing this block. The block is quite pretty in itself and makes a lovely quilt design as illustrated in the two sample quilts shown.